By the time Frank W. Benson was fifty, he was internationally famous and his career was secure. The painter who won every award the art world had to offer, whom journalists dubbed “America’s most medalled artist,” was in great demand as a portraitist. His sparkling, sun-drenched paintings of his children at their summer home on Maine’s North Haven island, were bought as soon as they were finished by collectors and museums alike. His interior studies of models in his Boston studio were highly praised. As co-director of the Boston Museum School, he had helped make it one of the premier art schools in America. He sat on distinguished juries of all the major exhibitions and was a member of an elite group of American painters – known as “The Ten” – whose exhibitions were eagerly anticipated by the art world. 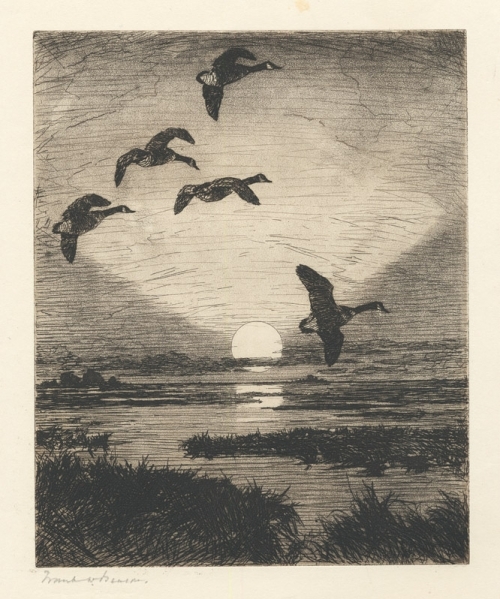 Why would such a successful painter make what appears to have been a 180-degree turn and become a printmaker, specializing in images of wildfowl and men at sport? The answer has its origins in his childhood. Born in the seafaring town of Salem, Massachusetts, Benson was most at home in the out of doors. He was given his first boat at twelve and spent countless hours sailing the waters of Boston’s North Shore and tramping the marshes near his home, a shotgun slung over his shoulder. Benson loved the wild birds that flew above him or skittered along the shores, paddled through the marshes and soared on the afternoon breeze. He filled sketchbooks with images of them in all attitudes of flight and rest. 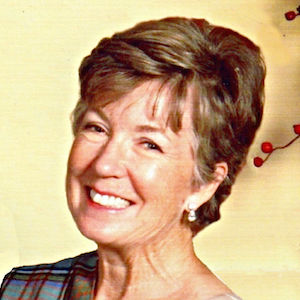 Benson’s mother convinced his father, a cotton broker, to let their son attend Boston’s Museum of Fine Art School instead of following his father into business. Young Frank was driven and disciplined. Never happy with just being “good,” he sought excellence – not so much for his teachers as for himself. His journals and letters reveal him to be excited about challenges, eager to try different things and loyal to his friends. These qualities deepened as he grew older. Benson’s first known works, created at the age of about sixteen, were a pair of oil on board paintings depicting a snipe and a rail bagged on one of his local hunting trips. Although he originally wanted to be an ornithological illustrator in the manner of Audubon, Benson changed direction while in art school in Paris. He put aside depicting birds for the next two decades. It was at the hunting shack he owned with his two brothers-in-law on Cape Cod’s Nauset Marsh that Benson began to experiment with depicting wildfowl and the men who sought them. 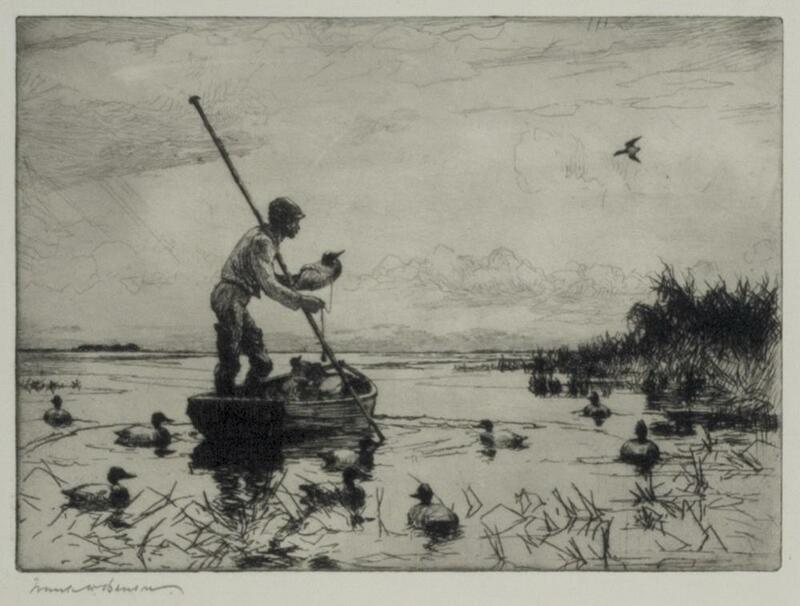 Although he had created a few early oils of various birds he put that medium aside to make black and white ink wash drawings that were given away to his hunting companions and family. 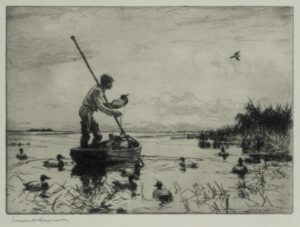 When he tried exhibiting a few of these drawings they sold – in the words of his sculptor friend, Bela Pratt, “like hotcakes.” This positive response not only encouraged him to create more studies of wild birds but also may have inspired him to try depicting them in two other black and white media: etching and drypoint. The challenge of the exacting science and art of etching may also have been just the distraction he needed from the political storm that was brewing at The Museum School, which he and Edmund Tarbell had successfully run for over 20 years. In 1912, the School’s Board began discussing the idea of removing the administration of the school from the hands of the instructors themselves and putting in place a general director. Benson and his colleagues were stunned. The school was thriving; they saw no need for change. They tried to work out a compromise. Emotionally charged meetings were held and contentious letters were written. The school was in an uproar. Newspapers reported the turmoil and the Boston art world was in shock. Under Tarbell and Benson’s stewardship, the School had thrived and brought Boston great renown. There were threats of resignations. The following fall, Benson returned to Boston only to discover that the Museum School Board had reached a decision: By 1913, the instructors at the School would be working under a general manager. Benson and Tarbell had promised all the instructors that, if the Board instituted this form of administration, they would resign. True to their word, they did. The year following his resignation was a tumultuous one for Benson. The first of his “homegrown models” – as he called his three daughters – married and left home. The New York Armory Show opened in the winter of 1914, causing a furor in the world. But, very quickly, the public’s taste began to change. 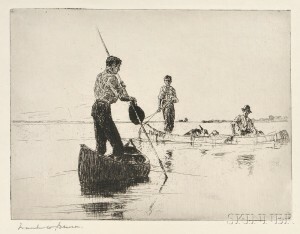 Modernism was on the horizon and art critics began to regard Benson and the other traditional American artists of the day as “old hat.” Although it would appear that he had originally intended etching to be a pleasant diversion or an interesting hobby, once he no longer had the security of a regular salary he may have considered the possible salability of the trials he had been producing. I believe that, with his daughters no longer available to be the subjects of his sparkling Impressionist works and his time freed from the rigors of teaching, Benson felt ready for a major change. The fact that collectors and critics alike were looking for the next new thing may well have not been lost on the artist. Within just a few years, Benson’s prints and the sporting watercolors he began creating in 1921, had supplanted the portraits, studio works of models in luxurious settings and painting of his daughters on windswept hills against August-blue skies. Benson the Impressionist had become Benson the Sporting Artist. This essay is a portion of the foreword that Faith Andrews Bedford has written for the forthcoming book about Frank W. Benson’s figural etchings and drypoints written by John Lewis and John Ordeman. Watch these pages for the announcement of its publication.